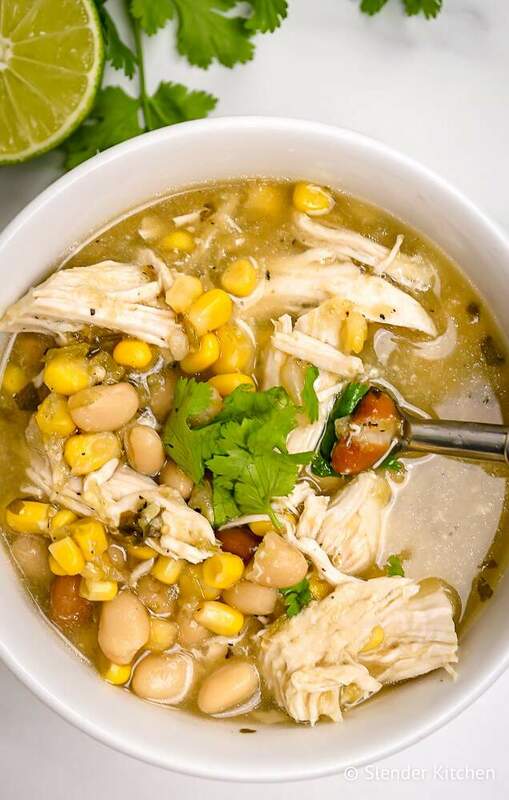 Zero Point Weight Watchers Chicken Chili is packed with chicken breast, beans, corn and uses store-bought green salsa to make a super delicious and spicy broth. Make it in your slow cooker, Instant Pot, or stovetop. 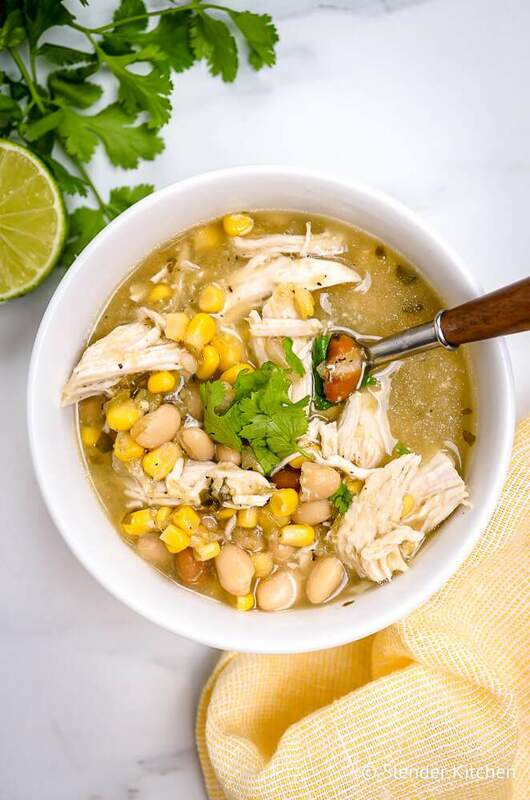 This super easy to make Weight Watchers White Chicken Chili has zero Freestyle Smartpoints and taste so so good. It’s a seriously delicious chili and one of our new favorite zero point soups along with this Weight Watchers Taco Soup and Weight Watchers Cabbage Soup. Weight Watchers Chili is something that everyone on WW should absolutely have in their fridge or freezer. It’s the perfect solution when you have accidentally eaten all your point or are saving up for a special occasion. Made with all zero point foods, it’s hearty, filling, full of protein, and most importantly, tastes really really good. And if you aren’t on Weight Watchers, it’s just a really tasty soup that’s also really good for you. The other amazing thing about this chili is that it couldn’t be easier to make. There isn’t any chopping, browning, mincing, or hard work. Instead, we let store-bought salsa verde do all the hardwork. Just dump everything in and dinner is ready in as little as thirty minutes. Now before we get into the recipe, let’s talk about the green salsa for a minute. This is the main flavor component of this recipe so you want to make sure to buy a salsa verde with lots of flavor. It adds spice and tang and heat with needing to buy lots of ingredients. Now of course,y you could definitely make your own salsa for this chili as well. It’s just a bit of extra work. Slow Cooker: This is such an easy way to make this chili. Just dump everything into the slow cooker, set the slow cooker to cook on low for 4 hours, and the soup is ready. Since chicken breast can get dry when cooked too long, I wouldn’t recommending cooking it longer than 4 hours. In fact, three hours may be plenty if you have a crockpot that runs hot. Instant Pot: This is also super easy to cook in the Instant Pot. Just add everything to the Instant Pot and set to Manual for 8 minutes. Let it come to pressure, this will take a while with all the liquid. Then let it naturally release. Depending on the size of your slow cooker, make sure not to overfill it and go past the “max” line. You can also add more broth after. The salsa is a huge part of the flavor for this recipe so make sure to choose a salsa with lots of flavor. Herdez makes a great green salsa that you can find in most stores. Trader Joe’s also sells a good salsa verde. If you like things really spicy but can’t find a hot green salsa, then add some fresh jalapenos or serrano peppers to the chili. You can also add chili powder or cayenne.